ARE CHECK-IN CALLS ENOUGH TO KEEP YOUR STAFF SAFE? From facing unpredictable weather conditions and wildlife to working with hazardous chemicals or heavy-duty equipment in perilous locations, if your lone workers suffer an accident or injury, how do you confirm their well-being? Check-in calls are one of the most common methods of confirming your employees’ safety—but is a check-in call enough? Many call-in schedules operate on a two-hour check-in basis. Others only require call check-ins when entering and leaving a site. While your check-in call procedures may meet your organization’s health and safety requirements, what happens if one of your lone workers is hurt in between check-in times? Are you confident you will be able to send help in time? The monitoring of lone worker safety traditionally has been managed through spot-checks by supervisors, phone or radio-based check-ins by each employee, with help of the buddy system or not at all. In recent years, electronic monitoring solutions, such as Blackline’s Loner® product family, have contributed to automating continuous monitoring of personnel and their well-being. This is accomplished by combining automatic and manual safety alert triggering with wireless communications and location technology to help find an employee in distress. In addition to manual triggers for help, leading safety monitoring solutions blend fall detection and person-down detection with employee check-in prompts. But aren’t employee check-ins passé? The quick answer is yes and no—read on to learn how a modern employee check-in monitoring product feature can differ from old-school processes and increase the value to organizations. Traditional lone worker check-in processes require all employees to periodically cease their work to manage a check-in. Sometimes these check-ins are informal, requiring the employee to call a co-worker, an individual who is on call, their supervisor and even a call center or automated phone system. Regardless of who performs the monitoring function, your business is losing valuable productivity during the employee’s check-in—such systems are not acceptable in our Information Age. Businesses must balance the scheduled interruption with the need for productivity. Compounding the situation, the time to detect an incident is limited by the check-in interval itself. A two-hour check-in respects the business’ bottom line but also leaves a large window for risk. Your employee could be anywhere after two hours. Electronic technology provides the opportunity to eliminate the employee productivity drain while providing an increasing level of rigor. Some safety monitoring solutions can provide a configurable check-in timer that requires the employee working alone to check in on a more frequent basis, delivering a more timely safety alert when required. Such a request is normally through an audible, visual and tactile indication by the person-worn safety monitoring device. The employee’s responsibility, if he or she is present and able, is to press a check-in button. Without such a button-press within a configurable time period (often 30 seconds), a missed check-in alert will be communicated to monitoring personnel. DON’T OTHER AUTOMATIC ALERTS REMOVE THE NEED? Some organizations choose to leverage fall detection and person-down detection as the main safety monitoring automations to detect an employee in need of assistance. The answer to this question relates to optimizing the safety monitoring approach for each employee’s role and environment. Some employees work in and out of high-vibration environments, for example. Regarding automated person-down detection, high environmental vibration may be sufficient to degrade consistent detection of an incapacitated employee. In this case, a periodic employee check-in request provides the rigor to ensure ongoing well-being without an impact on productivity. In contrast, other employee roles may not require a check-in process. The first step is to decide on a check-in interval that usually ranges from 15 to 30 minutes for higher-risk activities to every hour for lower-risk applications. Because safety monitoring device check-ins have a low impact on productivity, a more frequent check-in period increases rigor while it does not degrade emergency response capability. The second step is to choose the time offered to the employee to check in when requested—often, employees are required to check in within 30 seconds but for noisy environments this can be increased to 60 or 90 seconds. Real-time employee safety monitoring solutions address the shortcomings of manual check-in processes. Blackline’s Loner® employee safety monitoring solutions detect safety incidents in real-time using True Fall Detection®, no-motion (person-down) detection, and missed check-in detection. Employees can also request help instantly if they are able. 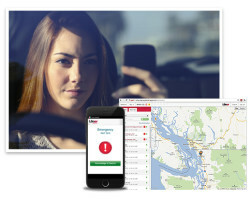 Loner solutions combine communications and employee positioning technology to notify monitoring personnel in real-time of a safety incident with complete knowledge of who the employee is, where he or she is located, the type of safety alert, and where other nearby resources are located. Please join me for our upcoming webinar “The Safety Landscape is Evolving: Are you Prepared?” where we will explore occupational safety and compliance and bring you up-to-speed on safety legislation. Register today! next post »HOW DO YOU MEASURE THE VALUE OF YOUR EMPLOYEES’ QUALITY OF LIFE?